Jesus Christ was an amazing example for the disciples to follow as they learned how to be on mission to tell the world about the grace and love of Jesus Christ. As Jesus ascended into heaven, He told the disciples to wait for the Holy Spirit to come over them because Jesus knew that the Spirit would serve as a guide and a teacher in His physical absence. During the Jewish feast of Pentecost, the disciples got what they were waiting for. The Holy Spirit, the presence of God Himself, took up residence inside ordinary bodies – their bodies. The disciples immediately hit the streets with a bold new style that the world has never recovered from. I’m teaching through the Book of Acts this semester. I’m not teaching at Lander this Spring, but I am teaching a survey of sorts. I’m teaching it in 3 places: 1) College group at our house on Wednesday nights, 2) worship team practices on Wednesday nights, and 3) this blog. I will be sharing some insights here weekly. I’m teaching on Acts for a few different reasons: 1) it’s a book of the Bible, 2) it’s really good, 3) we are tragically neglecting the role of the Holy Spirit in our lives, and 4) I have never known such a time as then when Christians were more confused concerning what the Church really is. We are clueless to what the Church really is. What a passionate and eclectic day of worship today. We went everywhere from gospel to a capella and about everything in between. Last week, we had nothing but an acoustic set from the floor, this week, we had about everything else! We were very blessed to have One Heart help lead us in worship this Sunday. Peggy is a part of our normal worship team, but she also sings with an a cappella group called One Heart. 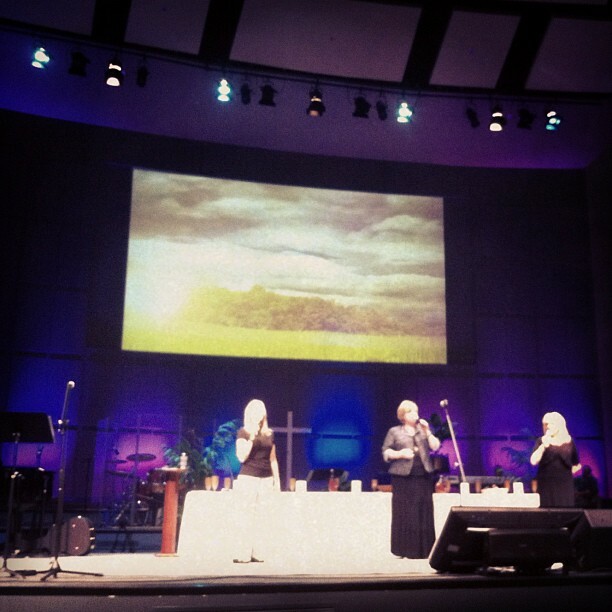 Becky and Beth were gracious enough to join us for our worship this Sunday. As we focused on the Holy Spirit, I asked them to do a medley of Spirit songs. I don’t think they had ever sang that arrangement until this morning, and it was so fantastic. What a way to welcome the Spirit’s presence. Got to see some sights from last week’s Shake-n-Shine camp and hear stories from Jeff. Such an incredible mission-focused summer (Africa girls get back tomorrow). Jeff’s message on the Spirit was so refreshing. Baptists need to “remember” the Holy Spirit. Unfortunately, he is the often neglected member of the Trinity. This message was a powerful reminder of the Spirit’s work in salvation. What a great morning. 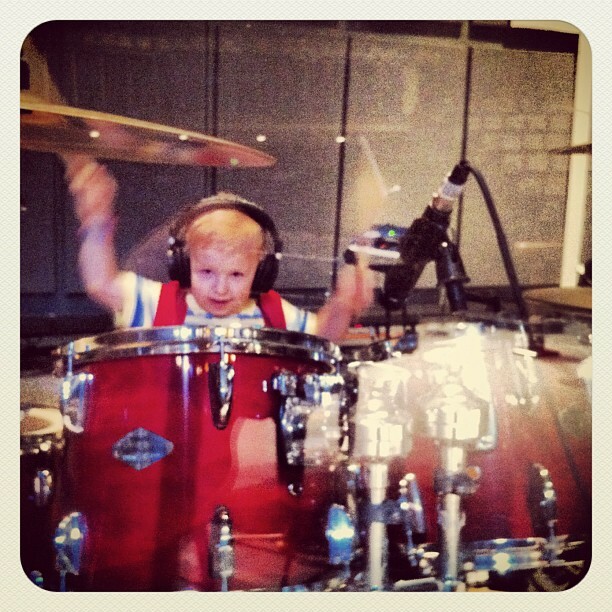 The boys normally go to soundcheck with me, but birthday boy Obadiah was extra rowdy on the drums this morning. It was such a powerful time of worship today at North Side. I can’t begin to tell you how much the Holy Spirit united the service today. There are times when we plan elements together and it’s great to watch them fall, and then, today, I listened to Jeff preach his sermon and use words that were verbatim of the last song we were going to do after his message on Mary anointing the feet of Jesus. I figured he had looked at the flowsheet and studied the lyrics, but something also told me that maybe this was a God orchestrated thing. Turns out he didn’t know what the lyrics of the last song were, but as he preached in his message about “focusing on the gift instead of the Giver…Giver of every perfect gift…being satisfied in only Jesus…” It was wild.